It’s been a while since I wrote in the blog. I’m alive and I am still shooting :-). But anyway, the picture above was made earlier tonight. 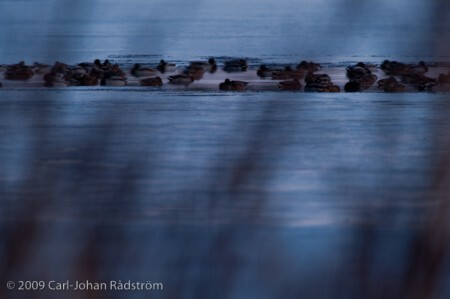 Söråselesjön is partly frozen so the birds that are still here gather where the ice is open. The sun had disappeared behind the mountain a half hour earlier. I made an exposure at two seconds to capture the movement among the mallards.